Took another swing at the splash page opening of "The Trickster." 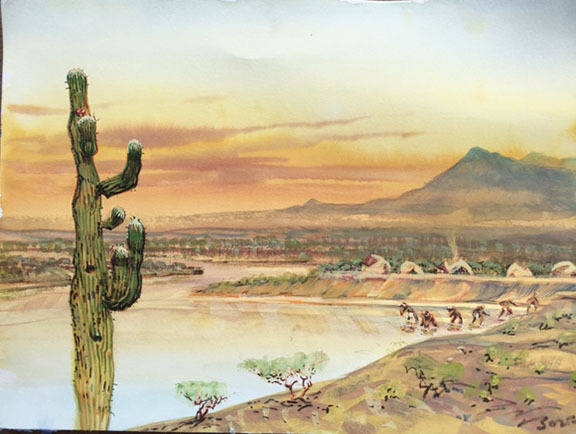 Daily Whip Out: "An Apache Rancheria On The Gila River, 1866"
It's a soft opening (first two pages of the book) and it's being questioned by my teammates (Hutton and Mariotte) so we'll see. My position is: I'd rather do a movie style open, as opposed to the usual superhero comix open with the hyper-action poses. Anyway, I'm going to finish this sequence and lay it out the way I see it unfolding and then we'll all decide. 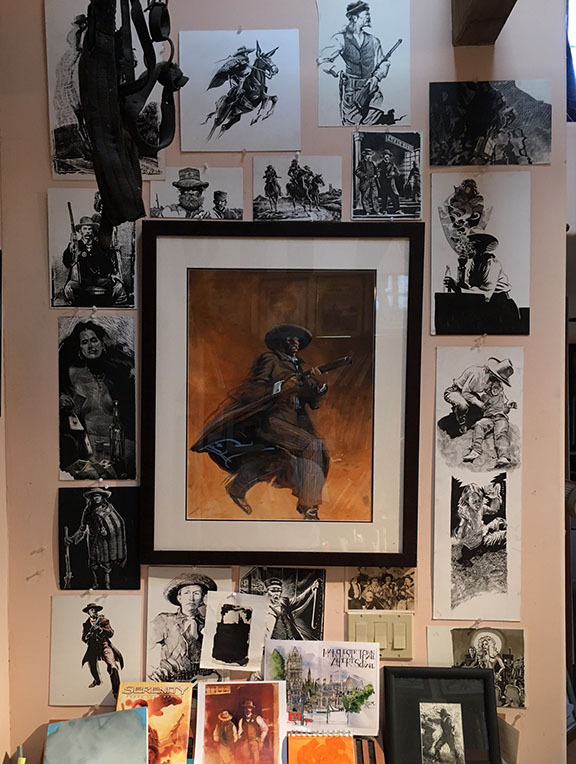 When we went out to the studio, Casey said, looking at a wall of my scratchboards and pen and inks, "I like all these—it looks like next level comix." Interesting take by a millennial (he's 26). The wall above my main art desk in the studio. I've long aspired to execute Western stories in a graphic novel format, complete with illustrations that look like they could have been done by Russell or Remington. I realize that is a tall order, but that has always been my goal. "Originality is nothing more than connecting familiar elements in unfamiliar ways." I like the "soft" opening too....and LOVE the "wall of art". Keep up the good work my friend. I can't wait to buy your book!! !